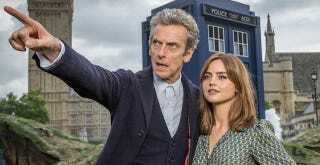 Speculation and rumor ran rampant this week as to whether this season of Doctor Who would be Jenna Coleman’s last. And after the BBC had to report that the BBC declined to comment, it’s finally official. Today, Coleman told BBC Radio 1, “I have left the Tardis - it’s happened. I’ve filmed my last scenes.” Coleman’s leaving Clara behind to step into Queen Victoria’s shoes in a drama for ITV. Since we actually have a real announcement this time, it seems really unlikely that Coleman’s going to change her mind—like she did for the last Christmas special, which was meant to be her swan song. It’s been in the works for a very long time. Steven [Moffat] and I sat down a year and a half ago and tried to work out the best place to do it and tell a really good story. We’re not going to give any details but it will happen at some point this season... We worked out a really good story arc out so hopefully people will love it. The “at some point this season” comment could mean she’ll leave during the traditional season finale or a more interesting mid-season switch. Of course, that would mean that either a new companion has been found and cast in secret or the Doctor’s going to run alone for a bit or returning character(s) will be picking up the slack. So when the show returns on Saturday, start looking for the clues leading to her exit.